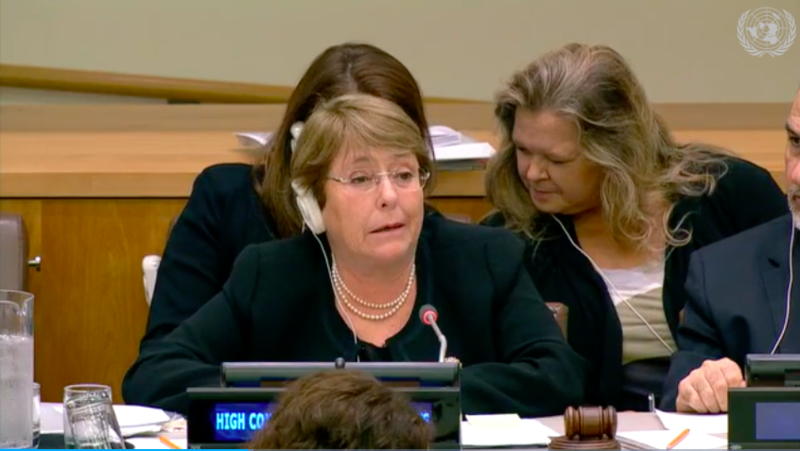 On 15 October, the newly appointed High Commissioner for Human Rights, Michelle Bachelet, addressed the Third Committee of the United Nations General Assembly, and then answered questions, concerns, and complaints from member States. The High Commissioner underlined the importance of human rights for the achievement of sustainable development and peace, and in that regard drew States’ attention to the critical role of the Human Rights Council, the human rights mechanisms, and OHCHR, both in their own regard and in combination with the General Assembly and Security Council. The High Commissioner confronted the notion that the UN human rights system is somehow antagonistic towards States, explaining that the system is there, primarily, to help States secure improvements in the promotion and protection of human rights on the ground. This, in turn, would represent a major contribution to the realisation of the 2030 Agenda for Sustainable Development and the SDGs. Her convictions were shared by many State representatives, who expressed support for closer coordination between the UN’s work in Geneva and New York, as well as the prioritisation of human rights within the 2030 Agenda and the emerging prevention agenda. The High Commissioner presented her annual report to the Third Committee, extolling the important and relevant work of the Human Rights Council, as well as the body’s increasing links to New York-based UN entities. In order to illustrate her words and show the impact of the UN human rights system, Ms Bachelet offered several case studies: the UN’s work in Kenya to ensure that no one (including members of vulnerable groups) would be left behind in the drive to realise the SDGs; OHCHR’s support for the Tunisian Government to help secure the adoption of a new law on the elimination of violence against women and girls; and the UN’s work on transitional justice in Colombia. The High Commissioner noted the importance of highlighting ‘positive human rights stories’ and expressed her eagerness to continue to do so. In laying out OHCHR’s management plan and goals, she reiterated that OHCHR needs the ‘support of governments to work with us, for the benefit of their people.’ She asked for the particular support of the Fifth Committee in order to secure adequate funding, and that that all GA committees respect the decisions taken by the Human Rights Council, and vice versa. In the ensuing interactive dialogue, States addressed the High Commissioner, making recommendations, issuing complaints, and posing questions. Several States criticised the Council for what they claimed was selectivity and the increasing ‘politicisation’ and ‘misuse’ of human rights. Other States asked how OHCHR intends to address specific thematic issues such as causes of conflict, the death penalty, LGBTI rights, and internal displacement. Some spoke of their domestic experiences of engaging with the UN human rights system: Mexico, for example, noted that recommendations from the UN human rights mechanisms had helped the Government to strengthen the enjoyment of human rights domestically. Some member States had specific suggestions for the High Commissioner, as well as for each other. Morocco, speaking on behalf of the African Group, asked whether Ms Bachelet intends to improve the geographic balance of staff in OHCHR. Nigeria urged States to improve cooperation in the promotion of human rights; Switzerland called on States to improve funding to OHCHR; and China called for increased dialogue and cooperation at the Council. Several States raised the importance of economic and social rights, and the right to development, noting the important connections between human rights and the SDGs. For example, Iceland, speaking on behalf of Nordic and Baltic countries, underscored the importance of placing human rights at the heart of efforts to implement the 2030 Agenda. Several States made points about strengthening connections between the UN’s human rights bodies and mechanisms, based in Geneva, and the UN’s wider work and agenda, especially in New York. For example, Spain and Iceland both called for greater coordination and coherence between Geneva and New York, while Guatemala called for a strengthening of the human rights pillar in a reformed UN. Strengthening the role of human rights in the UN’s prevention agenda was repeatedly raised as a key priority within these wider efforts to bring ‘Geneva’ and ‘New York’ closer together. For example, Chile drew the attention of States’ to the importance of the human rights system in providing early warning of, and preventing, conflict. Germany asked how to mainstream human rights into the Secretary-General’s prevention agenda, including what could be done to encourage the Security Council to regularly consult OHCHR. Switzerland spoke of the role of the High Commissioner and the wider human rights pillar in the Secretary-General’s reforms. The High Commissioner responded to critiques leveled against OHCHR and the Council by recalling that the work of human rights mechanisms must be based on facts and remain impartial. She added that when OHCHR has a mandate to monitor and report, it must necessarily have access to, and secure the cooperation of, member States. This is also in the interest of concerned States, as OHCHR will be able to gather more information and different perspectives. On the question of mainstreaming, the High Commissioner cautioned that mainstreaming can come to mean invisibility. She is keen to integrate a human rights perspective into the work of all parts of the UN system – but it must be done in a meaningful way. On the issues of prevention, she noted that prevention is among the OHCHR’s core activities and the Council has contributed conflict prevention in the past. However, she recognised that the human rights pillar must improve its performance in this area. As part of that, she called for increased cooperation with the Third Committee and the Security Council, as well as with regional organisations and mechanisms (which can play a key role in early warning and early response). The High Commissioner agreed with member States on the strong connections between the SDGs and human rights. She noted OHCHR’s important work in this area – premised on ensuring a key role for human rights in development policy. This, she contended, is the only way to address inequalities and secure the implementation of the 2030 Agenda. Finally, the High Commissioner stressed the importance of civil society participation in the Council, which brings significant value-added to the body’s work.